This is a report of investigations performed by the David W. Taylor Naval Ship R&D Center, dated August 18, 1980. Disk-rotor pumps having various configurations with interdisk spacing ranging from 0.006 to 0.26 inch were investigated at operating speeds from 3,550 to 7,000 revolutions per minute. 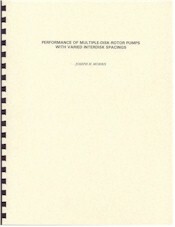 Operating data for the pumps with various rotors is included. Good performance at wide inter-disk spacings was obtained.